Getting your message where your audience sees it. Banners and building wraps can have multiple applications: from commercial advertising to obscuring building sites or giving a preview of something that will be unveiled. Building wraps can even be used while refurbishment of an older building is being undertaken, to make it a more pleasurable image for the viewer. Building Wraps Banners and building wraps can have multiple applications: from commercial advertising to obscuring building sites or giving a preview of something that will be unveiled. Building wraps can even be used while refurbishment of an older building is being undertaken, to make it a more pleasurable image for the viewer and communicate a message at the same time. By choosing building wrapping as an advertising channel, you make a statement about your business that will be seen by current and future customers alike. Furthermore, affordable materials can be used to offset the initial investment. 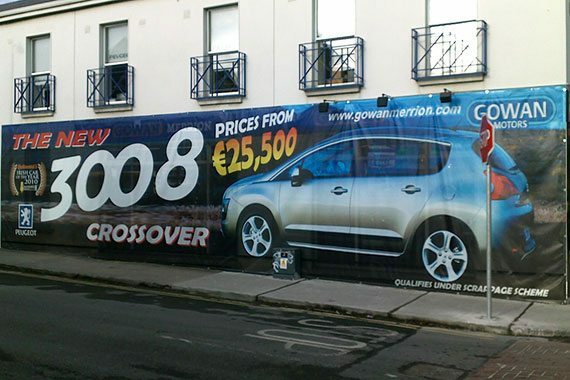 Digitally printed banners are among the most affordable exterior graphics used for outdoor advertising. We design and produce in-house all types of promotional banners in heavy weight PVC & mesh material. 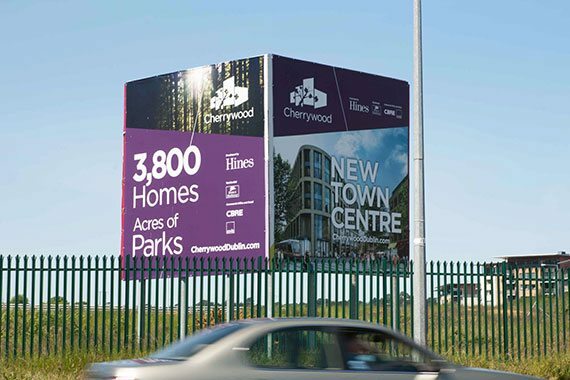 We print with durable pigments that provide protection against UV-fading and weather, effectively turning a printed banner into a long-term investment and a contribution to creating a truly branded environment in your premises. 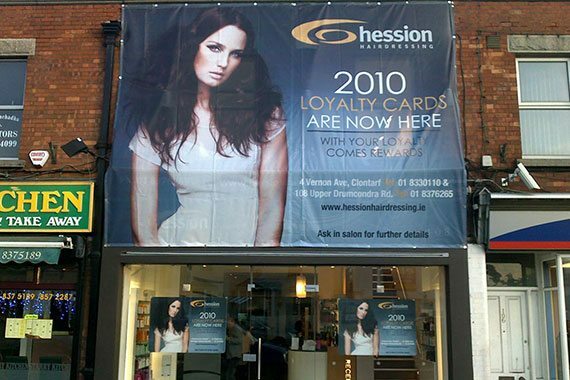 Banners are most often used to promote a company’s logo, a special promotion or an event. PVC banners can be used over and over again as all the signs are removable and can be changed without having to purchase a new banner. 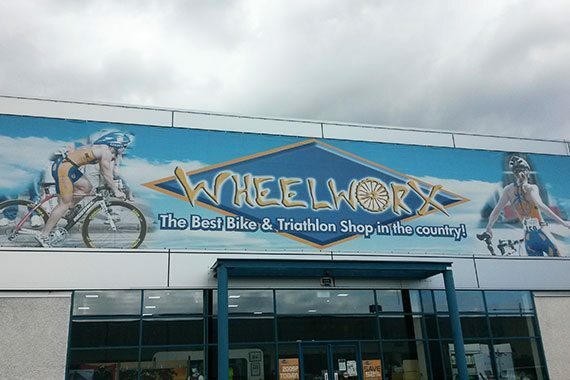 Our experienced fitters can install the banners using our heists & access equipment. They are also experienced in building wrap installation, ensuring that the banners and wraps are fastened securely and don’t tear easily. We are available to work on a very flexible schedule. 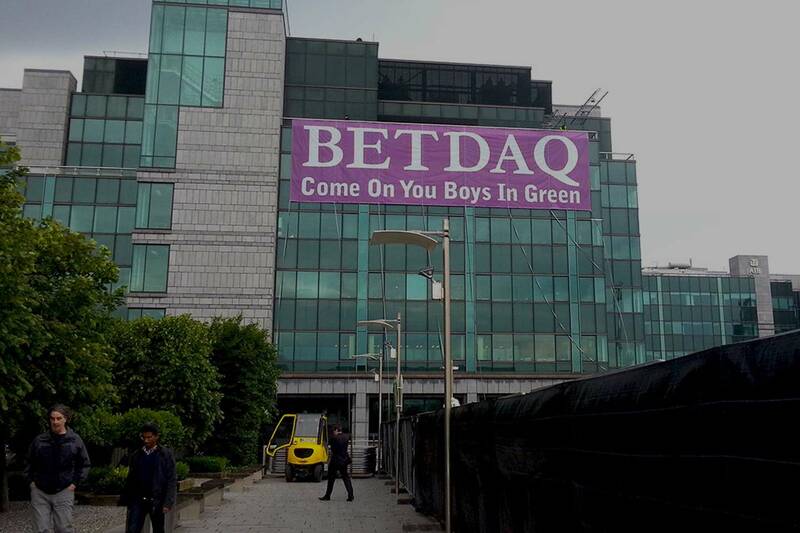 For example, the Betdaq banner on the right was requested 1.5 days prior to the Ireland Euro finals. Vision printed & erected a 132 square meter banner on time. Contact us now for more info about our building wraps!